The success of a restaurant is primarily dependent on the customer service you provide. However, what attracts your customers to your restaurant and retains them will depend not only on the food but your restaurant interior design as well. The idea is to create an atmosphere that puts the customers at ease while they have the most fantastic dining experience. A great Restaurant Interior Design provides a welcoming ambiance to your customers and makes them enjoy their meals. Studies show that the interior design of a restaurant is one of the factors that influence customer satisfaction and behavior. High level of customer service and food quality are an essential aspect that will make any restaurant stand out in the long run, but over the years with the growing competition restaurant, interior design has emerged as an equally necessary key of success. Many times restaurants do become customers’ favorite just because of its ambiance and interior. 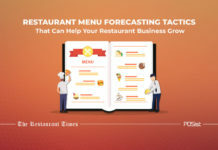 Therefore, every restaurant owner should plan on including unique and attractive ideas for their restaurants interior design which would positively influence your customers before they even taste your food. According to a study, Furniture Comfort was the most important Restaurant Interior Design characteristic followed by Music Style, Conditions of Plates/Glasses and Lighting. Also, background noises are perceived as most unimportant characteristic. Read below how your Restaurant Interior Design plays a crucial role in your restaurant’s success. Often the interior design of the restaurant becomes its USP and becomes a primary reason why customers revisit your restaurant. Customers these days are always looking for new experiences, and a fresh and quirky restaurant interior design catches their eyes. After including distinct and remarkable designs related to medieval themes or associated with some famous series, your customers won’t just come to your restaurant for food but also ambiance and the visual appeal since they do spend a lot of time looking at the interiors when they are waiting for their food to arrive. In the age of Social Media, where customers take pictures of food before they eat, an eye-catchy interior becomes a major USP of the restaurant. When your customers are at ease at your restaurant, they are likely to spend more time, and also order more. The interior designing of your restaurant can undoubtedly contribute to increasing the productivity of your restaurant business by giving your customers an environment that makes them feel like that they are at maximum comfort. The interior designing theme of your restaurant will influence your customer’s mood, and that will decide their selection of the dish or dishes they want to order. The interiors of your restaurant play an essential role in hospitality. The mesmerizing look and feel of your restaurant can have a positive impact on your restaurant business and provides you with an ROI that you have invested. Your interior designs should be artistic, compelling and be engaging with the target consumer profile. The first impact that any restaurant does on any customer is visual. You can also charge a premium price for the impeccable hospitality and ambiance that you provide. For any restaurant to be able to stand alone in any such crowded industry like the restaurant industry, your restaurant should be able to provide not only excellent food but a mesmerizing dining experience with a unique enhancing environment. 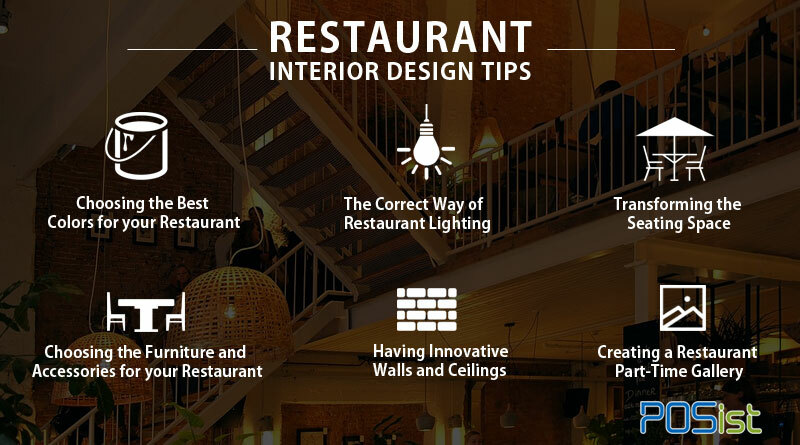 The following restaurant interior design tips should be kept in mind while deciding on the ambiance of your restaurant. It is an undoubted fact that colors unconsciously shape many aspects of a person’s daily life. Colors can impact the food choices of customers, and also affect the amount of money they spend in a restaurant. Since color perception is connected to emotions, color plays a role in the happiness of your customers. Different colors stimulate different emotions and can profoundly impact feelings of hunger and thirst in customers. Colors also influence people’s attitudes towards their surroundings. Read a detailed piece on how restaurant interior colors can affect your customers’ food choices here. Modern interior design goes far beyond the stereotypical black and white color scheme. Sharp contrasts are a significant part of the contemporary interior design to give it an impressive and stylish look. A modern restaurant should have a color combination that includes one or two dominant colors, with touches of a contrasting color to add interest to the over-all decors and space. For example; you may go for red and white combination adding the flavor of black in-between few places. You could make a sober look for your restaurant with an exciting mix of dark green and pale yellow. Cha-Bar located at Connaught Place, New Delhi is famous all over Delhi between the youngsters for the varieties of distinct tea flavors of Assam tea, Darjeeling, Nilgiri, Sikkim and Nepal that this place has to offer. However, the other striking feature of Cha-bar has been its walls with the perfect blend of colors like white, blue and black. Lighting forms an integral part of your restaurant interior design. The lighting of the restaurant can add to enhance the aesthetic appeal and creates the mood and ambiance of a lively space. The lighting of your restaurant should be able to complement and enhance the theme of your restaurant. Evolution of Remote Contol and Apps will make sure Restaurants can control lighting easily and can perform additional functions like changing colors & dimming. Decorative lighting also plays a vital role in enhancing the look and feel of your restaurant space. Decorative lighting includes pendants, sconces, chandeliers, table and floor lamps, and cylinders. Decorative lighting should complement and add visual interest to the interior, as well as provide or contribute to the overall lighting plan. The positioning of lighting should be done to enhance your restaurant theme and also fulfill the restaurant requirements. For example, if there are fewer windows with less entry for Natural Lighting, the restaurant lights should provide ample illumination in the area. Lighting also depends on the working hours of your restaurant and whether the dining area is indoor or outdoor. You can use yellow or golden electric lighting to give a warm feeling if your restaurant is a fine dining restaurant. If you are running a café or casual dining restaurant, going for bright lights would be the best option catering to the youngsters’ mood creating a vibrant ambiance. It is mostly suggested to use pendants and chandeliers in restaurants to create an elegant and stylish environment. The light fixtures of your restaurant can be used to depict the theme or ambiance of your restaurant. One such example is The Black Rabbit in Bangalore where one could not resist but be attracted to the beauty of large hand-painted bells hanging from the center of the ceiling and functions as mesmerizing lights. While doing interior designing of your restaurant, your focus should not be only to accommodate furniture that goes along with the overall ambiance and theme. Keeping the comfort of your customers in mind should be your top priority. The accessories that you choose for your restaurant need to be carefully planned. Right from the paintings and table centerpiece to your silverware and dishware; even the napkins contribute to your restaurant interior design. If you have a vibrant wine and coffee bar, wooden chairs and stools with tall windows will enhance the experience of your customers while they sip on some great coffee or wine. However, if wooden chairs are being used, they have to be painted smoothly or polished. If you have a fine dining restaurant, sophisticated leather sofas with magnificent chandeliers and dim lighting will attract your customers like never before. Using silk cushions with the stunning tableware will add to the beauty of your restaurant’s mouth-watering food. Ideally, the furniture in the restaurant should be systematically arranged to keep bar counter separate from the food area. The Tasting Room, Mumbai is one fine dining cozy restaurant with the warmest and romantic interiors. The candelabras, silk cushions and deep pink walls with the most stunning tableware and furniture add to the beauty of this appealing restaurant. One area in which any restaurant can show its creativity through innovations in the seating area. Unique seating arrangement can make any restaurant stand out from the competition. There are lots of ways in which you can make your restaurant look lively. A current chair can be given a new look by painting it fresh. You could go with square or rectangular tables which are space efficient as well provide a stylish look. A quick-service restaurant mostly uses fixed booths that are easy to be maintained, while fine-dining restaurants or lounges might use luxurious sofas for the comfort of your customers. Drawing a seating plan helps you experiment with various layouts to find one that suits your needs depending on your theme. Nowadays restaurants are focusing on providing a unique experience to customers by providing them with a space to sit and relax and enjoy the food. Once such place is Café Wanderlust, Gurgaon. What attracts the customers to this café apart from its delicious food is its unique seating arrangement which ranges from bean bags to comfortable chairs to other innovative seating arrangements. The walls and pictures all over the place are its most eye-catching feature that keeps customers coming back for more. The ceiling of your large or small restaurant should reflect the same luxurious look of the place. Contemporary restaurants have their appetite for modern designing with different kinds of impressive and attractive light effects which blend well with the softness of symphonic music and a bar. The architectural design of your ceiling should be eye-catching with a strong visual. The patterns of the ceiling can be arranged in a casual pattern with a combination of contrasting colors like white-pink, blue-white, pink-purple. In 2018, restaurants will be focusing on creating Custom Art-Inspired designs on the restaurant walls to create a one-of-a-kind masterpiece which is unique to their Restaurant and can’t be replicated easily by their competitors. The Olive Bar and Kitchen, Mumbai has the most beautiful white walls with classical French dishes does makes any day of the customer enriching and memorable. The green plants in the surroundings make the customers feel fresh while they have the mouth-watering food! Restaurants have become outlets for some of the most creative interiors in the world. Your part-time restaurant gallery can give your diners a world to escape to. Technology, art, and nature can be blend together to create an imaginary world for your customers which can be very appealing to everyone’s eyes. Your art gallery could also showcase the artistic work of different artists. Malaka Spice, one of the fine dining restaurants in Pune, Maharashtra is one such restaurant that promotes the local art and talent displaying paintings of various artists throughout the month. The paintings are mainly in the form of cityscapes and landscapes with vibrant colors with subtle sketches. Malaka Spice is all about the experience of dining in the middle of a carefully curated art gallery. Well-planned restaurant interiors contribute to the success, and the profits, of any dining establishment. Planning your restaurant interior design begins with market research, continues with understanding market trends and concludes with strategic execution. Great article with so much information. Thanks for sharing the tips and restaurant interior design ideas. Decorating a restaurant space is more than just having knowledge of architecture. It is also about marketing. Thant means using the space to promote your restaurant and sell more. Food and beverage experts speak of restaurant concept development. Good Read Restaurant Times. It is great to know how the restaurant interior design helps in bringing in more customers. Often restaurant owners believe it is all about the food but this article certainly proves that wrong.